Fergus McCaffrey is very proud to present the gallery’s first exhibition of works by the critically acclaimed Irish painter Brian Maguire (b. 1951). The exhibition opens on Thursday, March 5, with a reception for the artist and continues until April 25. Since 2010, Maguire has worked regularly in the Mexican city of Juárez—the murder capital of the world—where more than 5,000 people have been butchered by drug cartels over the past six years. The exhibition includes fourteen large paintings completed between 2012 and 2014 that address the Mexican drug war. For Maguire, painting is an act of solidarity with the forgotten and voiceless. His figurative paintings and portraits confound tradition by using the authority of the genre to bring dignity to the overlooked and marginalized. These are some of Maguire’s largest and most nuanced paintings to date, which he has crafted with larger brushes and thinned-down acrylic on canvas. He works slowly, using photographic sources, searching for that point where illustration ceases and art begins. 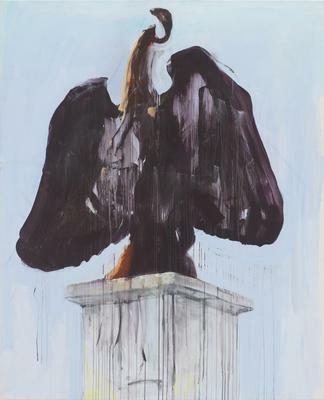 Maguire’s aesthetic sensibility and practice can be traced back to his involvement in the struggle for social justice during the civil rights movement in Northern Ireland in the 1970s. Born a decade or more after the German Neo-Expressionists, Maguire’s peers include Martin Kippenberger (1953–1997) and Francesco Clemente (b. 1952), but his kinship with Marlene Dumas (b. 1953) is most pronounced, in their outrage at moral hypocrisy and their concerns with both social justice and violence against the body. Maguire’s preoccupations draw him to the margins of the art world—alternative space, prisons, women’s shelters, and mental homes—making shows in traditional gallery and museum spaces something of a rarity. A major retrospective of Maguire’s work was organized by the Hugh Lane Municipal Gallery of Modern Art, Dublin (2000), and traveled to the Contemporary Arts Museum, Houston. He has shown with Kerlin Gallery, Dublin, since 1990, and represented Ireland at the 1998 Sao Paulo Biennial. 1 Ed Vulliamy, "Painted back to life: Brian Maguire's portraits of the victims of Mexico's 'feminocidio’," The Guardian, May 4, 2014. Katrina Weber Ashour: +1.212.627.1455 / katrina@fitzandco.com.